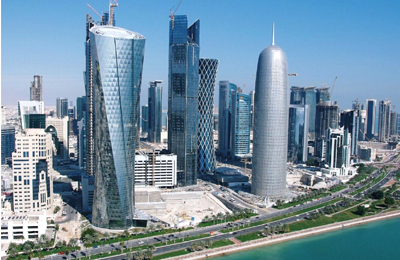 Qatar's economy grew 5 per cent from a year earlier in inflation-adjusted terms during the second quarter of 2012, as strong expansion in non-energy sectors including finance and construction largely offset a slacker energy sector, government figures showed on Saturday. Gross domestic product growth slowed from the first quarter, when it was 6.9 per cent year-on-year. Second-quarter GDP climbed 2.5 per cent from the first quarter, the figures released by Qatar Statistics Authority showed. The Opec producer's economy is dominated by energy production, which accounts for roughly half of output. But that sector grew in real terms by only 0.8 per cent from a year earlier in the second quarter and shrank 0.1 per cent from the first quarter, because of softer global oil prices. By contrast, the financial services sector grew 12.1 per cent from a year earlier, transport and communications output rose 18.0 percent, and the construction sector increased 10 per cent. Qatar has embarked on a major infrastructure building programme, partly in preparation to host the 2022 soccer World Cup. In June, Qatar's state planning authority said it expected economic growth of 6.2 per cent this year, slowing to 4.5 per cent in 2013, the weakest rate in a decade.